Do you believe in synchronicity? Have you experienced things happening to you exactly when you needed them to happen? An event which caused a dramatic change in your outlook towards life? You dream of a person and then that person call you the next morning saying she was thinking about you all night? Synchronicity is a word coined by the Swiss psychologist Carl Jung and describes the temporally coincident occurrences of acausal events. You can't prove it scientifically nor can you predict it. My first memorable brush with synchronicity was after my engagement. I discovered that every Saturday evening my fiance went to a Shiva temple at his place. I used to do the same thing. He joked that Lord Shiva had played the matchmaker in our case. After reading the book 'The Secret' I began to notice my thoughts and how sometimes events occurred that matched my mood or state of the vibrational frequency of my thoughts. I began to notice the way how I usually met people whom I don't like exactly on days when I was going through a low phase. 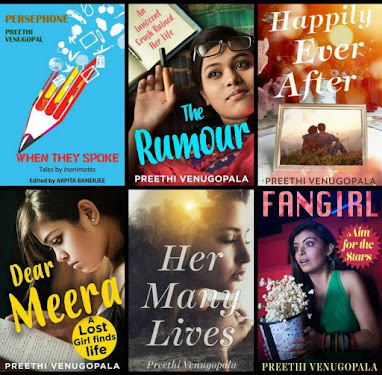 Books or blogs that I had to read began finding me at the right time. 'Heal your body' by Louise L Hay was the perfect example. 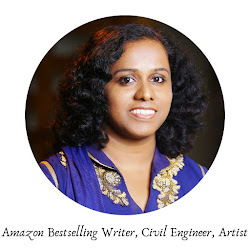 The Reiki course and subsequent meeting and friendship with Saileela, who would take me through a journey of self-realisation through past life regression, were other significant synchronic events. Impressed by the book 'Heal your Body' I went to Sapna Book House to look for other books written by Louise Hay. I selected three books and then a deck of angel cards fell into my hands. 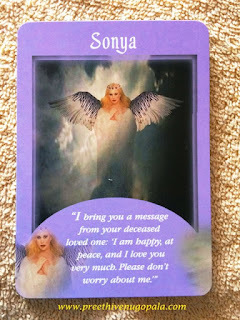 It was the Messages from your angels oracle cards. I had never seen or heard about oracle cards and hence kept it back on the shelf and continued browsing. When I asked for a particular book the assistant came forward and pulled out a book from the shelf causing the same deck of cards to fall into my hands again. 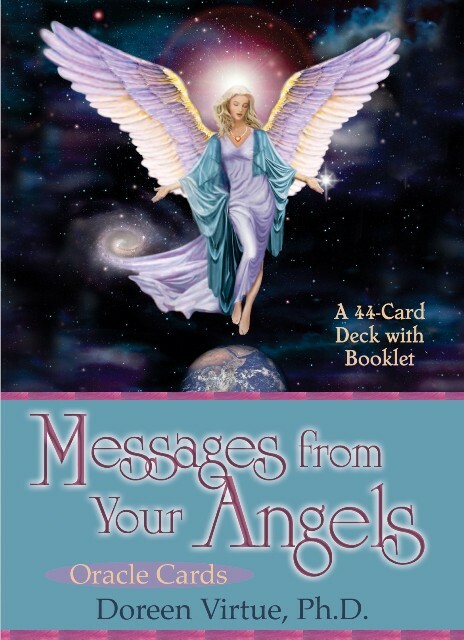 As I was already intrigued and as all esoteric things charm me, I decided to buy the deck of 44 cards that promised to give me messages from my angels. The year was 2012 and I had lost my father in March 2011. After reaching home, I uncovered the pack and read through the instructions. Then I shuffled the deck and pulled out a card. During the entire time I was shuffling, I was thinking about my father. I can't explain why I was doing that but during that phase in my life, I was always thinking about him as the loss was recent. The card that came was this! Needless to say, I was gobsmacked. I ran to my husband and told him about it. He wanted to test them and I asked him to think about something that he wanted an answer to. He got this card. He rolled his eyes but confessed he was actually pondering over whether to join the nearby gym or not. I narrowed my eyes. He wanted the angels to answer that? Wasn't my daily nagging enough? I then asked him whether he would, now that even the angels had spoken. He walked away muttering, "She started again." 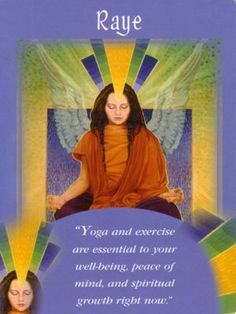 Doreen Virtue has become my guiding angel since then. I am a regular visitor on her YouTube channel and Facebook Page. The most recent brush with synchronicity was during the book release of Niranjan Navalgund's The Lively Library & an Unlikely Romance. There was a lucky draw happening onstage. Names of all the people in the audience were in a bowl and I was watching the chief guest picking the winners. Suddenly I felt that I had to be ready as I had to go on stage next. I removed my glasses and kept them in its pouch and next moment, I heard Niranjan announcing my name. I have begun to acknowledge that synchronicity is all around. We just fail to notice it. Next time something significant happens, think back to what you were thinking at that moment. Have you had a brush with synchronicity? 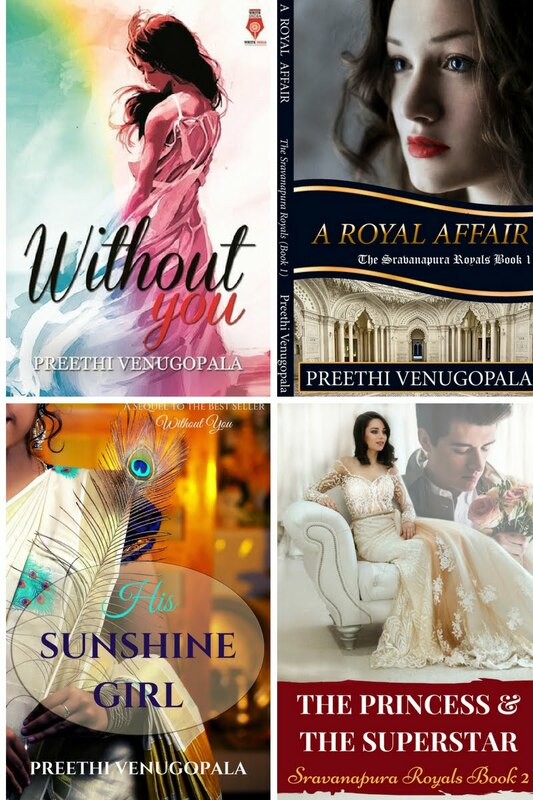 Thank you, Saileela for reading. Yes, we don't recognize it often. Wow! Great to know that. Very interesting post! I am also drawn to quite a few things you mentioned in the post.